Looking for the next big social media land grab? A lot of artists see Social Media as the modern savior of art sales. But Big Business is slowly taking over the promised connection that social media once offered. Artists are casting around looking for the next great opportunity to reach their collectors outside of the gallery system. Due to its open nature, some early adopters of Instagram have found great success. 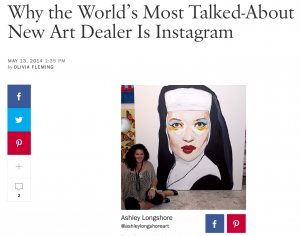 In Spring 2014, Vogue magazine called Instagram the “Next Big Art Dealer.” They highlighted a handful of artists who are selling massive amounts of art on Instagram and auction houses that are using Instagram to announce their upcoming sales. One artist, Ashley, has used Instagram to magnificent success. Her Instagram account only has a few thousand followers, but she has connected with the right people. Her enthusiastic Instagram followers include celebrities and other wealthy art collectors who can’t wait to buy her next piece. Journalists love her too. She’s been featured in major newspapers and magazines, all because of her Instagram account. And it’s not just Ashley. Dozens of artists from all over the world are gaining recognition and making sales from their Instagram accounts. And Instagram doesn’t cost a thing. Hi, I’m Cory Huff. I’ve been helping artists like you sell art online for five years. I’ve spent the last six months doing in-depth research on how artists are selling their art online. I’ve been coaching clients one-on-one and talking to artists like Ashley who’ve had massive success, to crack the Instagram code. I have to tell you that right now is a golden moment for artists to seize the day, jump on Instagram, and start connecting with their ideal collectors – collectors who are hungry for awesome art, who see Instagram as the place to find it. During this live webinar, I’ll be answering all of your questions about Instagram. We will stick around until everything is answered to your satisfaction. Is Instagram really this big of a deal? As much as I’m going on about this, you might think Instagram is paying me. They’re not. I’ve worked in online marketing for more than eight years. I’ve watched a lot of Internet fads come and go. I think Instagram is the real deal. It only took them 2 years to reach 100 Million users, and they’re still growing like crazy. Artists who jump on the bandwagon now have a golden opportunity. As with all of my courses, I guarantee you’re going to learn a lot. If you don’t, you can ask for your money back, no questions asked. “I did earn a commision from a local dance studio that I belong to…I contacted the owner, she looked at a few of my pieces and liked them and my ideas. So now I am doing 2, 12 x 12 paintings for her. If she likes them, she will comission 10 more for a total 12. If you want to learn to sell art on Instagram, you can certainly jump in and do it yourself through experimentation. But that’s what I’ve been doing for the last six months. 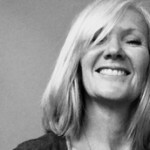 I’ll show you what works – surely your time is worth the $25 this webinar will cost?